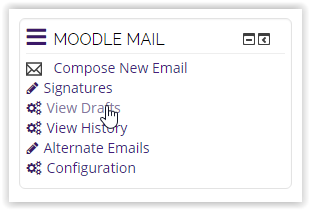 When using Moodle Mail, users have the option to save their emails as drafts until they finish composing. 2. Locate the Moodle Mail block and select View Drafts. 3. You will be directed to your Moodle Mail Drafts. Click on the red X to delete the draft. Clicking on the magnifying glass under the Action column will re-open the email so you can finish composing it.